Ranchi is situated 676 metre above sea level.Ranchi is the capital of the state Jharkhand.It is situated about 338 kms far from Patna,the capital of Bihar.Ranchi is known as the "city of waterfall" due to plenty of waterfalls.Ranchi is full of waterfalls, hills, and lush green valleys. With a pleasant weather and beautiful historical monuments Ranchi becomes one of the interesting tourist destination during the summer for not only the people of Bihar but from other state also.Ranchi is also noted for its rich mineral deposits and mining industries. It is located in the Chhotanagpur valley and the city lies at 23°23' N Latitude and Longitude of 85°23' E. located at a height of 2140 ft above the sea level. Ranchi even before it got its name was a part of old Lohardaga district of the British India. Then around 1831 a portion of it had a split and was coined as Non-regulation South-West Frontier. It was only in the year 1899 Ranchi got its name for a small tribal village named Ranchi was clubed with the existing place. With the expansion of the Mughal Empire, the sovereign status of the Nag Dynasty was technically affected, but they continued to rule and administer independently until the advent of the East India Company. During the period of the British Raj,adivasis and the local population of other ethnic backgrounds of Ranchi and other regions currently comprising the State of Jharkhand continued to oppose the subjugation by the British, and the region witnessed a number of uprisings and revolts. Sarhul which is celebrated during the spring season is one of the most important festival during which the deity of the protector of the tribal communities mainly Santhals and Oraons are worshipped.Sarhul is also celebrated as the festival of sowing seeds and, reproduction as it is regarded as the beginning of wedding season.The main attraction of the festival is its colourful procession. Tribal men, women and children wear their traditional and colourful dresses and perform their traditional music and dance around trees. It represents brotherhood and friendship among villagers. A 'prasad' called Handia or diang (beer made out of mixture of rice, water and some tree leaves) served in leaf cups are distributed among villagers.. This temple which belongs to the 17th century has architecture similar to that of the Puri temple and is situated on top of a hill. This temple is also referred by the name Chhinnamasta which is at a distance of about 65kms away from Ranchi.The presiding deity of this temple is Goddess Kali. This temple is known for its intricate carvings and beautiful idols which is about 38 km from Ranchi. About 39km from Ranchi on Tata road near Bundu stands on the desolate bush green the elegant sun temple fashioned in the form of huge chariot with richly decorated 18 wheels and seven life like horses ready to take of the all weather motorabe road upto the temple premises is likey to attract tourists who will be captivated to behold the newly Sun temple in the placid and serene surroundings leading to its celestial beauties. 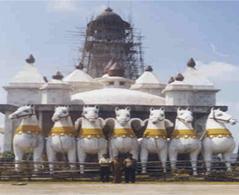 Angrabadi is a temple complex which accommodates the temples of Lords Ganpati, Ram-Sita and Hanuman and Shiva. The Shankracharya Swami Swarupanand Saraswati, having been captivated by serene, placid and celestial beauty of Angrabadi rechristened it as Amreshwar Dham. This is situated at a distance of 16km from Ranchi in Ranchi Ramgarh road near Ormanjhi.Many species of animals, trees and plants can be seen here. 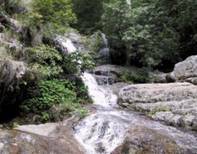 About 40km away from Ranchi on Tata road falls a village name Taimara near which flows the Kanchi river.Falling from a height of about 144 feet Kanchi river makes a pretty Dassam Fall known as Dassam Ghagh also encircled with charming scenes. About 4km.away from Ranchi on Kanke road just in fornt of CMDIL Hq,is situated the Gonda hill with a water reservoirat its top.At the foot of the hill is a big lake known as Kanke dam and a lucrative place for tourists. 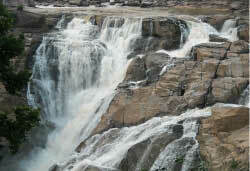 About 70 km from Ranchion the way to Chakradarpur is located Hirni falls.Being situated amidst dense forest Hirni is favoured by nature for scenic beauties. The tourists are carried away by emotions and flight of imagination. Ranchi is nature's bounty to mother India, which has been specially adorned with falls and streams.Hundru falls is about 28km away from Ranchi.The Swarnarekha River falls from a height of 320 feet making a wonderful scene known as Hundru falls. Jonha is about 40 km away from Ranchi.The road leading to Jonha is a bit narrow but not so rough and rugged as well as arduous as that of Hundru.This fall is named after Gautam as Gautamdhara as well. 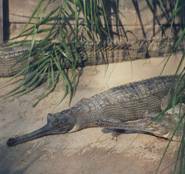 It is situated at a distance of 23km from Ranchi on Ranchi Ramgarh road near Ormanjhi.There are around 50 crocodiles. This is situated on Ranchhi Chakradharpur road which is 6kms from Kunti.This fall consists of five streams which falls from a good height. 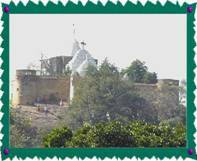 Ranchi being situated at an altitude of 2140 feet from sea level is a popular health and holiday resort and place of sacred pilgimage.A panoramic view of the town is got from the hilltop. The Shiva temple situated on the top of the hill is an added attraction for the devotees for whom it assumes the place of reverence during Shravanmas same as that of Deoghar. This is about 3kms from the Ranchi GPO at about 300 feet high. 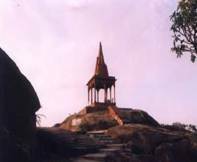 As the hill is associated with a history pertaining to Tagore family it is known as Tagore hill. At the foot of the hill are situated the Ramakrishna Mission Ashram and its office and centre of Divyayan and agrarian vocational institute. There is nothing special to shop in Ranchi, but however there are shopping complexes where you get both exported and imported products. Ranchi is well linked to important airports in India, including Patna, Delhi and Kolkata. Ranchi airport is located at Hinoo, nearly 7 km away from the city center. Kolkata is the nearest International airport, which is well connected to many cities in India and abroad. Kolkata is about 400 km from Ranchi and tourist pre-paid taxi charges about Rs 7500 from Kolkata to Ranchi. Ranchi railhead is well connected to important cities all over the country. Nearest station Hatia is a terminal station and many express trains starts from Haiti and have stop at Ranchi. Ranchi is well linked with many cities in Jharkand by state road transport corporation buses. The cities Bokaro (110 km), Chaibasa (130 km), Dhanbad (170 km), Patna (340 km) and Jamshedpur (140 km) are all connected to Ranchi. Tourist bus services are available from Kolkata to Ranchi costing about Rs 1200.